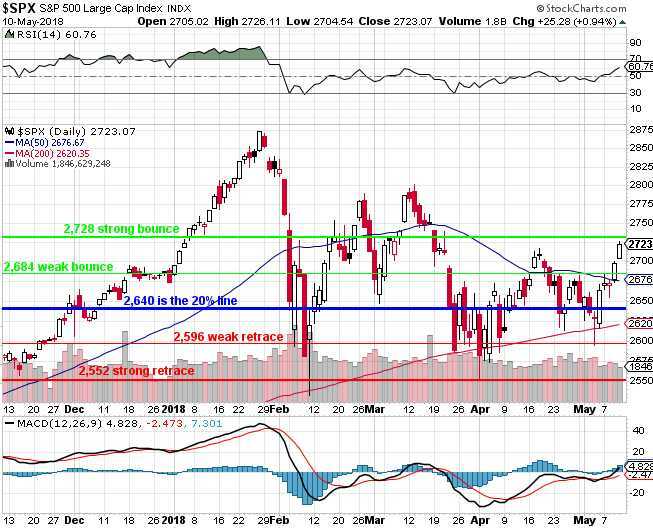 The Russell 2,000 Index is often disconnected from the other indexes but lately it's become disconnected from the economic data, which has turned substantially lower in Q2 while the index has rocketed from 1,500 on April 1st to 1,620 yesterday – not quite 10% in not quite 2 months. As you can see from Zero Hedge's chart, this is the widest disconnect between the Russell and the Economic Surprise Index (data better or worse than expected) since last October, when the Russell topped out at 1,520 and then corrected 50 points to 1,470 but it only stopped when the Data turned more positive. What's propelling the Russell to unreality this week is the suddenly strong Dollar, which is great for small cap companies who do the vast majority of their business locally, in US Dollars. But the Dollar can't keep up this pace and, in fact, just yesterday, the Hong Kong Monetary Authority stepped in to put a floor on their currency's slide and we can expect the PBOC and other Central Banks to follow as the Dollar hits the 5% Rule™ at 93.45. Given the 4.45 run from 89, we can expect a weak retrace of 20% of that run (0.89) so call it 0.9 and that takes us back to 92.55 and a stronger retrace would be 91.65 – so that's what we'll look for to see if the Central Bank Interventions are enough to stop people from running to the relative safety of the Dollar while the World is in turmoil (see yesteday's Morning Report). I told you I like CASH!!! "Volume has been anemic this week too with, 55M SPY shares trading on Monday, 67M shares on Tuesday, 59M shares on Weds and 68M shares yesterday vs an average volume of 101M shares so about 35% below "normal" volume, which is already close to half of last year's volume. Why is volume drying up like this? Because stocks are more expensive so the same money buys less and less stock and, because the economy isn't really growing – there is no more money to pay for the stocks – just a lot of idiots SPECULATING that there will be money to pay these ridiculous prices one day, so it's not important to actually earn any money because the greater fool theory will fix everything. 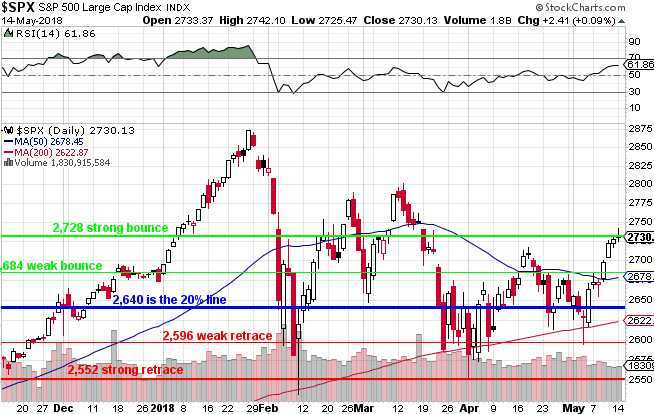 "The greatest fools, of course, are the last people to buy at the top – we call them bag-holders and I have been saying all week that this test of our Strong Bounce Lines is a good time to dump your stocks on the bagholders that are coming in and get back to CASH!!!. Again, I can only tell you what is likely to happen and how to make money trading it – the rest is up to you!" So far this week, the markets are down and the Dollar is up 1.5% and still cimbing this morning at 93.50, that's putting pressure on the indexes and commodities which makes people panic out of those and they then demand more CASH!! !, which drives up the price of Dollars (as they get scarce) and the cycle continues. People are also trying to trade in their dying TBills for cash – so even more demand for cash. Thank goodness housing is still dead or the Dollar would be back over 100! Technical Tuesday – Trouble at 2,728, Again! The market is so predictable. There's a ton of money to be made from predictable, so we're certainly not complaining. After a meaningless spike higher, the S&P calmed right down and finished right at our 2,782 line (2,730, actually) and this morning, as expected, the index is pulling back as the Dollar rises back to the top of it's range. Eventually, one of these will break out and the other will fall – but which one will prevail? We had a good run on /ES, all the way from 2,600 (barely touched two weeks ago) back to 2,728 and a 28-point run means we're looking for a 5.6-point retrace back to 2,723 (weak) and 2,717 (strong) and, even as I write this (7:30), the Futures bounced off 2,723, failed 2,728 again and are now testing 2,723 again but I think they'll fail as the Dollar is at 92.87 and rising and that's up half a point so we'll look for 2,717 and see how that's doing. The Futures on the S&P (/ES) pay $50 per point so it's a quick $300 if that bet plays out and, of course, simply stop out over 2,723 to limit the risk. 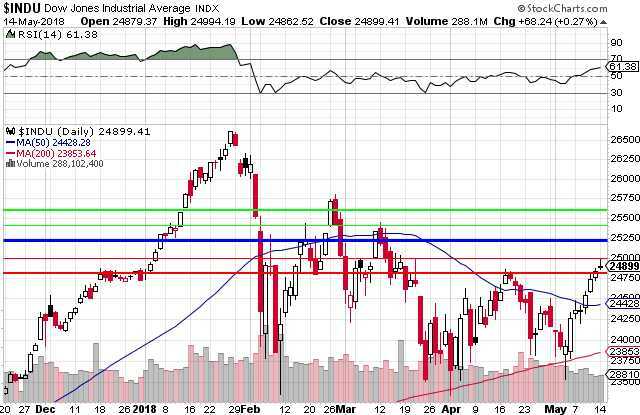 The Dow strayed down to the 200 dma at 23,750 so the run to 24,950 yesterday was 1,200 points and we'll call those rejection lines 250 points to 24,700 (weak) and 24,450 (strong) but that would take us back below the 20% line and that would be a big negative so very bad if 24,700 does not hold. http://welcome.philstockworld.com/wp-content/uploads/2015/09/PSW-Adooma-logo.png 0 0 Phil http://welcome.philstockworld.com/wp-content/uploads/2015/09/PSW-Adooma-logo.png Phil2018-05-15 12:23:342018-05-15 12:23:34Technical Tuesday – Trouble at 2,728, Again! 28 protesters were killed in Israel and 1,000 wounded this morning (so far). 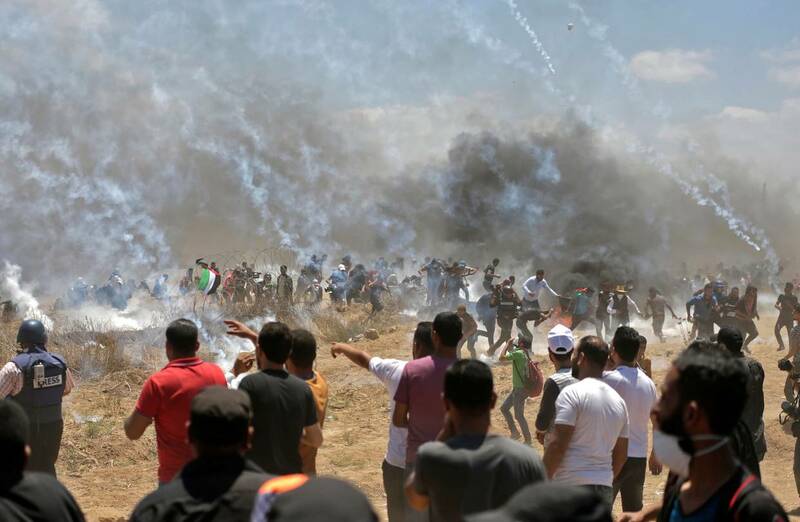 Jared and Ivanka were on-hand for the opening of the new US Embassy in Jerusalem and, to no rational person's surprise, things did not go well and now tensions are escalating and Hamas claims they will have 100,000 people ready to storm the fence between those two countries – this is, of course, the kind of tension Trump wants to bring to this country along our Mexican boarder. In more anti-American news, Iraqis voted for populist cleric Maqtada al-Sadr, who openly fought against US forces and has allied himself with the Communist Party but he ran on the Trumpian platform of "draining the swamp", which plays just as well with ignorant Iraquis as it does with ignorant Americans. This election puts al-Sadr on track to possibly become the next Prime Minister, which would be a tremendous blow that undoes all the progress the US has made in Iraq since the Bush years – yet another Obam policy Trump is completely reversing! This has sent the price of oil (/CL) and gasoline (/RB) spiking higher this morning but not before we got a nice dip in /RB back to $2.17, an $840 per contract gain from our short at $2.19 on Friday. 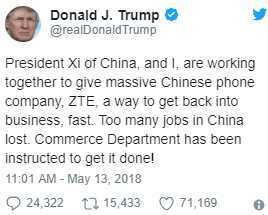 Speaking of reversing: Trump announced this morning that he will be lifting the ban on China's ZTE Corp, which had been accused of "egregious behavior" in evading sanctions the US has placed on other countries as well as having phones that were a Trojan Horse for Chinese spyware. Trump said in a Sunday morning tweet that he and Chinese leader Xi Jinping are working together to give ZTE “a way to get back into business, fast.’’ The U.S. blockade has choked off the revenue of the No. 2 Chinese telecom company, which regards the next two weeks as crucial as it faces potential collapse. The S&P 500 has blasted off our 20% line (that's 20% above fair value, by the way) to the 23.33% line at 2,728 and that's what we call a strong bounce from the fall we endured way back in late Jan/early Feb and doesn't actually mean a thing until we're over it. Otherwise, it's just a the top of the same trading range we've been in all year. This morning we have the Fed's Bullard speaking at 8:30, who used to be reliably hawkish but turned doveish last year – so anything can happen when he gives a speech this morning at his local Business Development Corporation (Springfield, MO) on "US Monetary and Economic Policy." People tend to get a bit more real when talking to their hometown crowd – like the time Trump boasted that he "could stand in the middle of 5th Avenue and shoot somebody and I wouldn't lose votes" to illustrate how blindly loyal his base was. In our Live Member Chat Room (my "hometown" audience), I called for shorting the S&P (/ES) at 2,725 this morning as well as the Nasdaq. Here it is in context. Markets holding on to yesterday's gains so far. All about that strong bounce line. Bullard speaking at 8:30 so we'll see what he has to say and then Consumer Sentiment probably decreasing a bit at 10, but nothing likely to move the market other than Trump's Drug speech later and that's bound to spook that sector so I'd short /ES here (2,725) as we know they have trouble at 2,728 so $150 loss limit but very likely to give us a little run lower (though maybe wait until Bullard to be sure). 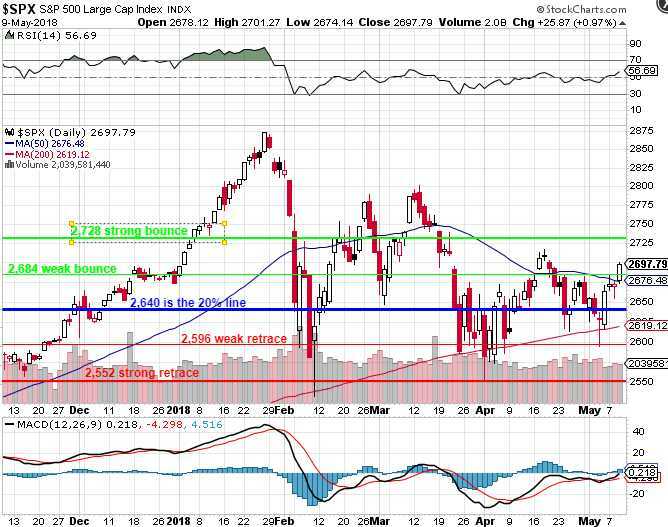 Trilling Thursday – Moving Back to the High End of the Range? As we did on April 10th, we're poking back over the weak bounce line on the S&P after a huge and silly rally that completely ignored what was actually going on both globally and locally. That spike lasted 3 days, less than March's 5-day spike over the strong bounce line but tied with February's spike over the strong line while January spent almost the whole month over the strong line before setting the year's lows (and the strong retrace) within 10 days. As we expected, yesterday was a fantastic day to cash out as there were buyers for our overpriced stocks all day long. Have a good vacation smart people who took my advice! We're expecting to top out at 2,720 (April's high) on /ES and then we'll try a short again but, as we did in yesterday's Live Trading Webinar (replay available here), we're still shorting the Russell (/RTY) below the 1,600 line (tight stops above) and /ES if they fail 2,700 – because we'd hate to miss that fun. Dow (/YM) below 24,500 and Nasdaq (/NQ) below 6,900 would confirm weakness. http://welcome.philstockworld.com/wp-content/uploads/2015/09/PSW-Adooma-logo.png 0 0 Phil http://welcome.philstockworld.com/wp-content/uploads/2015/09/PSW-Adooma-logo.png Phil2018-05-10 12:33:572018-05-10 12:33:57Trilling Thursday – Moving Back to the High End of the Range? This morning, despite President Trump moving the Doomsday Clock up another minute by unilaterally (which means without the agreement of ANYONE else who participated) withdrawing from the Iran Nuclear Treaty, which was put together after years of diplomacy with a dozen countries – including China. 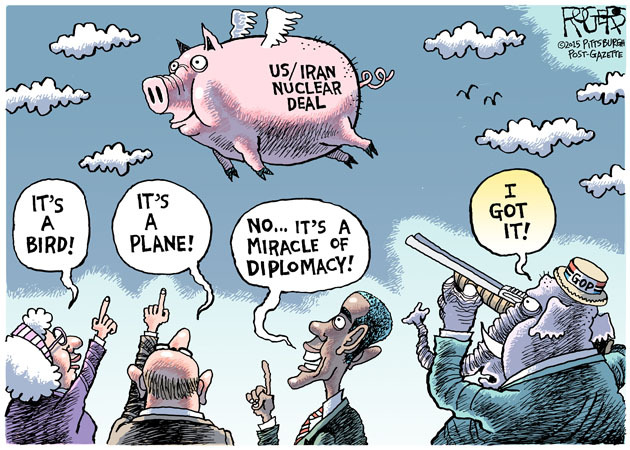 Now the World has to decide who they are going to side with – Iran, who, despite Israel's claims to the contrary, have been adhering to the agreement or Trump, who's a friggin' lunatic. Unfortunately, the lunatic already has A LOT of nuclear weapons and he's already stated he's not afraid to use them, so people don't want to be on his bad side. If anything, Trump's action justify Kim Jong Un's strategy of first building the weapons and THEN negotiating – as the non-nuclear Iran has become Trump's whipping boy while Trump is arranging to meet with Kim, a consideration he has not given to Iran. Former President Barack Obama, who rarely comments on his successor, issued a statement describing Trump's move as a "serious mistake" that could leave the US with a "losing choice between a nuclear-armed Iran or another war in the Middle East." Some of the US' closest allies, the UK, France and Germany, issued a statement expressing "regret and concern" about the decision, emphasizing Iran's compliance with the deal and their "continuing commitment" to the Joint Commission Plan of Action, as the deal is formally known. Iran's President, Hassan Rouhani, said he had ordered the country's atomic industry to be ready to restart industrial uranium enrichment, while the country's foreign minister said he would work with the pact's remaining partners — France, the UK, Germany, China and Russia — to see whether they could ensure "full benefits for Iran. Outcome will determine our response," Javad Zarif tweeted. If AAPL is not worth $1Tn, then the markets are in big trouble as AAPL is about 15% of the Nasdaq and 4% of the S&P 500 so, if they are going to top out here – the whole market could falter. Even worse, AAPL has climbed just under 20% in the past 3 months while the Nasdaq is up 7.2% and that's not good since 15% of 20% is 3% so AAPL is responsible for 1/2 of the Nasdaq's total gains since last earnings – if that trend reverses – things can get ugly very fast! So, step one to figuring out if the market is going to go higher is figuring out whether it's reasonable to pay $1 TRILLION for AAPL stock. Apple certainly thinks so, the company is in the process of buying back $250Bn worth of it's own stock and the average volume of AAPL is 37M shares or $6.8Bn at the current $185 price so just the additional $100Bn they have announced would make them the sole buyer of stock for 15 days but, in reality, all they need to do is buy 10% of that per day to create a lot of upward pressure on the price so, in effect, AAPL can easily be the biggest buyer of their own stock every business day for the rest of the year. Yes, this is Monday morning's Report. I don't have much to say about the markets, they are back near the highs and we'll see if they hold tomorrow, not today, as it's Monday and Monday's don't matter. What we do need to do is bargain-hunt in case it is a real rally and the best way to do that is to look back on past trade ideas and see if we can find some that haven't gone up yet. We did our last Top Trade Review in April, so it's a good time to do one of those and, as our Members well know, the vast majority of those trades turn positive so, when they're not, it's usually just a matter of time. As of the April review, we had looked at Top Trades that were initiated through July and, out of 36 trade ideas in 34 weeks, we had 29 winners and 7 losers but 3 of the losers turned around and that left is with 30 wins and 4 losses for a very solid 88.23% winning percentatge. Our Top Trades are what we think are our best trade ideas of the week with the highest chances of winning and we send out Alerts to our Members via Text and Email but we don't have a specific portfolio for them as they ofen ended up in one of our 5 various Member Portfolios already. I can only tell you exactly what is going to happen – the rest is up to you! It's like we've simply zoomed in on the exact same chart but that "zoom" means we've cut 1.67% off the range and now the S&P is stuck in a 3% range, between roughly 2,600 and 2,700 and, if we zoom out a bit more, we see that tightening range is wedged right between the 200-day moving average at 2,611 and the 50-day moving average at 2,688 and the narrower this range gets, the more those averages squeeze together leading to a very exciting resolution at some point. Remember, the 5% Rule™ is not TA, it's just math but we illustrate the math on charts – that's all they are good for, really. Charts tell you where you've been, not where you're going and, if you want to stay ahead of the market, you should use the 5% Rule™ – because it tells you which way the markets are heading. In January the 5% Rule™ told us the markets were wrong and the rally was overdone. That's why our Short-Term Portfolio is up 85% for the year – because we made the right bet at the right time. As you can see above, it turns out we had a perfect short on at 2,684 on /ES and then we fell right to the Weak Retrace line at 2,596, which was an 88-point drop and the S&P Futures (/ES) pay $50 per point, per contract so the gain from that play was $4,400 on the way down and then flipping positive at the bottom of the range paid another $1,500 per contract at 2,626 and now we'll see if this morning's Non-Farm Payroll Report can push us back to the higher end of the range. http://welcome.philstockworld.com/wp-content/uploads/2015/09/PSW-Adooma-logo.png 0 0 Phil http://welcome.philstockworld.com/wp-content/uploads/2015/09/PSW-Adooma-logo.png Phil2018-05-04 12:31:492018-05-04 12:31:49Non-Farm Friday – Is America Working?